You may not know her name, but you’ve probably seen her mischievous face on-screen. 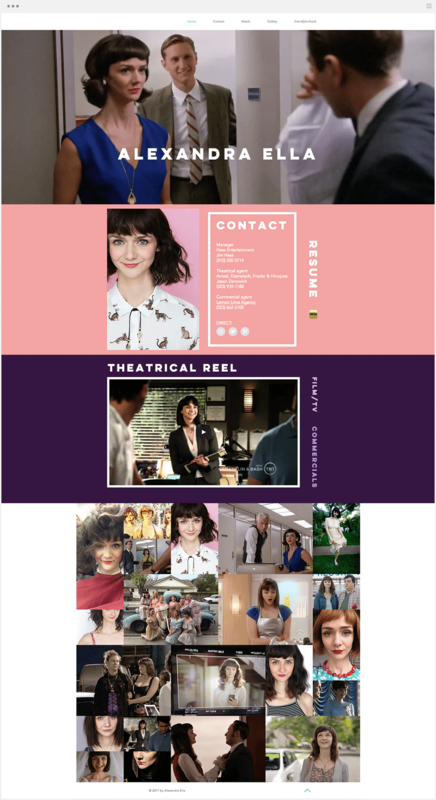 Alexandra Ella is one of the actresses from the award-winning series Mad Men – which might explain where she found the inspiration for the stunning vintage design of her Wix website. To present her (numerous) skills, she chose to go for a mash-up compilation of her most memorable scenes. Her brilliant move? That clip is displayed right under her contact and social pages, ensuring talent scouts and movie directors don’t have to scroll in order to book her for a shooting! Always dreamed of taking art lessons with the best? Last time we checked, Picasso isn’t really active on Instagram. But John Lovett is. This Australian artist works with oils, watercolor and mixed media, and he’s created unique teaching techniques that he displays on his website through Wix Video. River landscape, calm waters, waterfront reflections and more: you can learn how to create them all by watching his 10 to 15-minute videos, which are available online. Reminder – when uploading a video of your own: include a short textual description to accompany each video for an optimal SEO impact. Paula Deen is a celebrity chef and famous television host. She has published many books and even more videos where she treats her American audience with delicious meals. On top of her plethoric activities, she recently launched an online series, thanks to Wix Video. The different episodes, that she sells on her website (100% commission free), give an intimate glimpse into the chef’s life, in the highest quality possible. One tip you should take from this formidable business woman? Her online shop logo, that you can see (and click) anytime while watching the video. Crucial, since a good video can increase conversion by 80%! “In souls nobly born valor does not depend upon age,” wrote French playwright Corneille in Le Cid. You’ll understand how true this statement is when you’ll visit the website of the Los Angeles County High School for the Arts (LACHSA). This breeding ground trains the sophisticated storytellers and camera geniuses of tomorrow – some of them already filmed a commercial for Apple while being in school! Naturally, with such a vocation, you’d expect videos to be everywhere on their site. But actually, you’d be wrong. The school made the brilliant move of displaying their videos in just one place, but in a prime location; the top section of their homepage. If you were the video guru for top-tier fashion brands such as Revlon, Maybelline and Alexander Wang, one would expect you to have excellent taste; Stephanie West is no exception. Assuming that only raw jeans can enhance a pair of luxuriant shoes, she chose a very simple design (white background, no text), to make her videos naturally stand out. On the road to online fame, no fashion faux pas will be tolerated! Hannah Jacobs is a British animator and illustrator. Her films have been screened at the most prestigious festivals, including SXSW and Tribeca, and she has worked for clients like VICE, Vogue and Harvard. 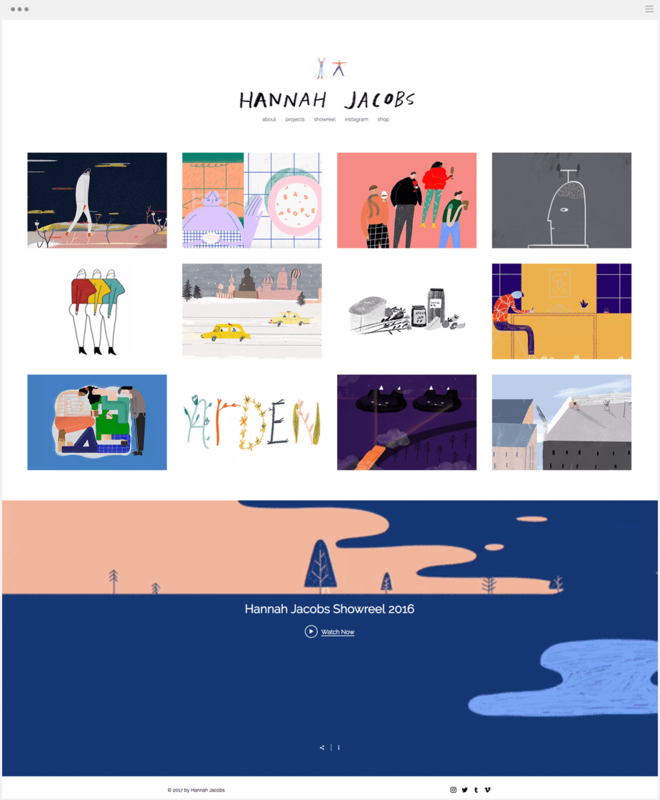 Finally, Hannah recently chose Wix to create one of the cutest and most-advanced online portfolios we’ve seen so far. But let’s stop the name-dropping, and let her videos speak for themselves. With animated miniatures that lead to the full videos placed right on her homepage, you get a sneak peak right at her talent upon arrival. Brit and Bren are two bright bairns (try to say that fast!). After the success of their YouTube channel, they recently launched a blog where, among inspired beauty and lifestyle tips, they share their thoughts on common topics for most teenagers – from (homo)sexuality to resisting bullies, to the impact of new technologies. As smart millennials, they know how to incorporate all types of content including, of course, video. Actually, a lot of their articles are in fact “vlogs” (video blogs), where you can see the two buddies talk about this and that. Creating a short video and sending them to your clients/subscribers to build a loyal community? Another genius idea from Brit & Bren, that you should definitely learn from. Eva Mendez, David Bowie, Olivia Palermo, Richard Gere… Diego Uchitel has portrayed the most iconic stars of the 20th and the 21st centuries. He’s also extremely talented when he switches his camera to the “movie” mode. 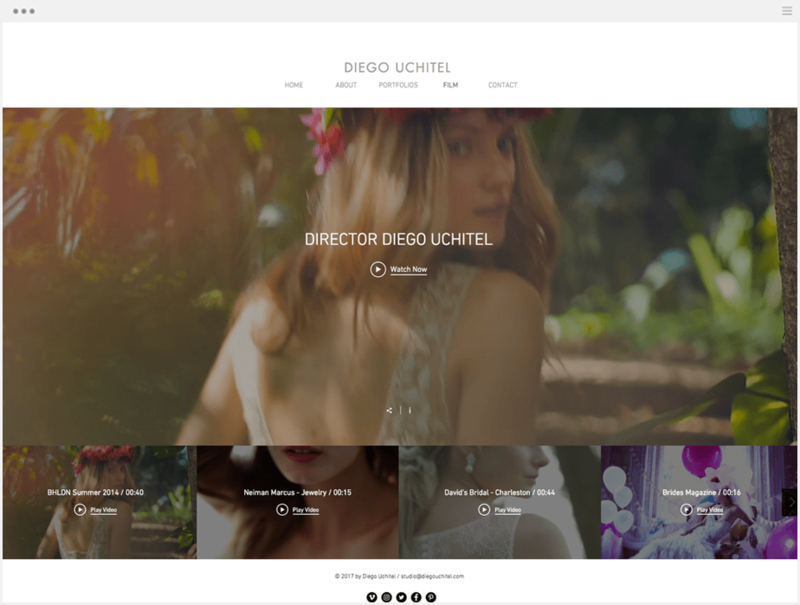 He shot a series of enchanting fashion clips that he displays on his online portfolio in a designated section. In order for his visitors to enjoy them to the fullest, he chose the “Strip” layout of Wix Video. This setup allows the viewer to access the rest of the channel through miniature videos displayed beneath the main video. Quality or quantity: why choose when you can have both? KisaKes is a production company based in Turkey. 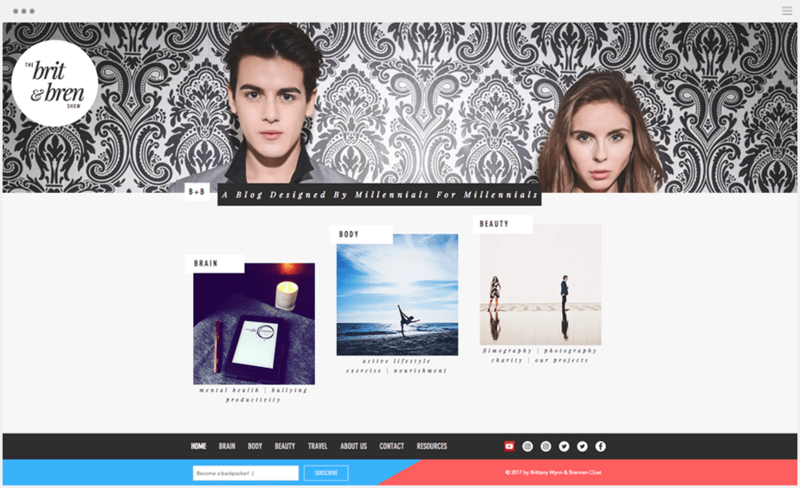 These super active and trendy folks create tons of different videos, and they want their website to represent them all. To do so, without overloading their design, they did something clever: they split their homepage into different strips, each one showcasing a different type of film (commercials, viral videos, etc.). This way, their visitors can have a glimpse at their full collection by simply scrolling down with their mouse or finger. Bonus: the strips are fully responsive, allowing for a perfect look on every screen and device! Green Cave People is a (very) creative agency founded by two award-winning film veterans. Their specialty? 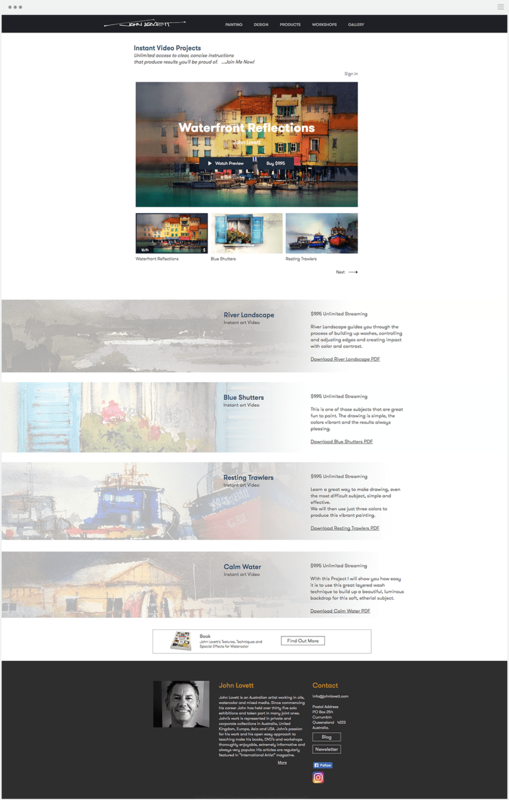 Telling a story like no other, whether it’s with words, videos, or – even more impressively – through their website itself. You have to check out their homepage and see how they split their site’s plot among different strips; it’ll make you want more and inexorably click exactly where they want you to. Genius! Yes, you know this man! Eric Braeden has portrayed the legendary Victor Newman on the number 1 rated daytime drama series, The Young and the Restless. He has his own Wix website, where he presents his bio and news to the countless fans eager to get to know the man behind that legendary mustache. For those who don’t feel like reading a long bulk of text, Eric provided his viewers with a dedicated “Interviews” section, filled with TV appearances. A short video rather than a long About page is a great alternative for any business’s website. 8 bodies, but one video. When you only have one content to promote, like this absolute must-see movie, the best option is to put it front and center. That explains the choice of a simple landing page, for a website with one purpose only. This way, the visitors are sure to see the trailer of the video, and if they wish, rent the full movie at any time on the same page. Interested in turning your website into the new Netflix of series, movies, tutorials or more? Wix Video might just be the right solution.